The holiday season is over, which means you’re probably already considering your next vacation. With a bit of luck, it’ll be to our friendly town of Placencia, a peninsula that feels as though it’s permanently on a break from it all. If you’re considering destinations, chances are that you’re also exploring potential accommodations – including VRBOs (vacation rentals by owner). Booking a VRBO can be a bit different from booking a hotel, and it’s not always easy to know what you’re getting. Let’s take a look at what a VRBO listing should include – and some steps you can take to make sure that you’re being taken for a vacation, not a ride. VRBOs deliver a much more flexible, home-y experience than a hotel. You’ll often have full run of a property, including a kitchen, laundry and its grounds. That said, a VRBO is someone’s home, not a hotel, so different rules and norms apply. While most VRBO owners will go the extra mile to make you feel as welcome as possible, check ahead of time regarding rules, restrictions or must-have amenities. Most disappointments arise over miscommunication, so don’t let that happen to you! If your VRBO is a stunning mansion in a perfect location, but it’s the same price as a backpacker’s hostel, there’s probably a catch. Those stunning surrounds, impressive square footage and endless amenities usually come with a comparable price. Check other properties in the area to gauge what’s standard, and ask for further verification about things like location, facilities and access if needed. You can also email past visitors or property managers to get a better sense of the property in question – and don’t be afraid to give the owner a call! Reviews from past guests are one of the best ways to determine what kind of experience to expect. Look for reviews that touch on the things that matter to you, and weigh them based on how recent they are. A review from a month ago will give a more accurate picture than one from several years ago. More reviews give you more data points, and also suggest that a place is popular – usually with good reason. Star ratings are a good shorthand, but remember that people rate in different ways, so taking the time to do some reading is your best bet. Go beyond the property’s own site and check out listing and travel sites to cross-check reviews. Before you hand over your credit card details, ask for a rental agreement outlining the dates of your stay, as well as any fees. Make sure that you’re clear about any terms, rules or restrictions before you book, too. When you do decide to make your booking, use a credit card. Most providers offer built-in protections that make it much more likely that you’ll get your money back if anything goes wrong. Paying with cash, check or via debit doesn’t have the same safeguards. Finally, avoid listings that ask you to wire funds – these aren’t always legitimate. Booking a VRBO is a great way to experience a destination through the eyes of a local. You get more freedom, flexibility and more bang for your buck. However, as with anything travel-related, good judgement goes a long way! 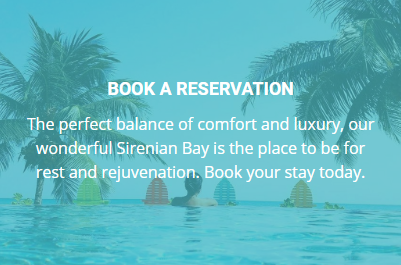 The villas at Sirenian Bay are VRBO properties – vacation homes offered for rent directly by the owners, as well as being part of the overall Resort. With only one owner, you can expect consistent service and quality in our villas. The owners and property managers are based in Dallas, Texas, but we have a team onsite as well. You’ll read a lot of reviews that praise the value of having hosts onsite at the Resort! Feel free to contact us with any questions about the property or your vacation plans to Belize! Until next time, Hugh Manatee signing off!